Nevada is unique due to the fact that it has three huntable species of wild sheep; Desert bighorns, Rocky Mountain bighorns, and California bighorns. Each year, residents are allowed to apply for all three species of sheep and nonresidents are able to apply for Desert bighorns and California bighorns. Total sheep populations for each of the subspecies are up based on the most recent survey results by the Nevada Department of Wildlife (NDOW). Desert bighorn sheep herds are up 4% with a total of 10,100 animals. California bighorn sheep herds also increased by an additional 100 animals, bringing the total count to 1,900 animals. Even the Rocky Mountain bighorn sheep, were up by 30 animals, bringing the state total up to 240. It a great time for wild sheep conservation success stories in the state of Nevada! All Nevada desert bighorn sheep are classified as the Nelsoni, or Nelson subspecies, and there are giant rams available across the state. Rams scoring well into the 170s are taken every year in many units. Nevada is clearly the land of opportunity for desert bighorn sheep hunting. 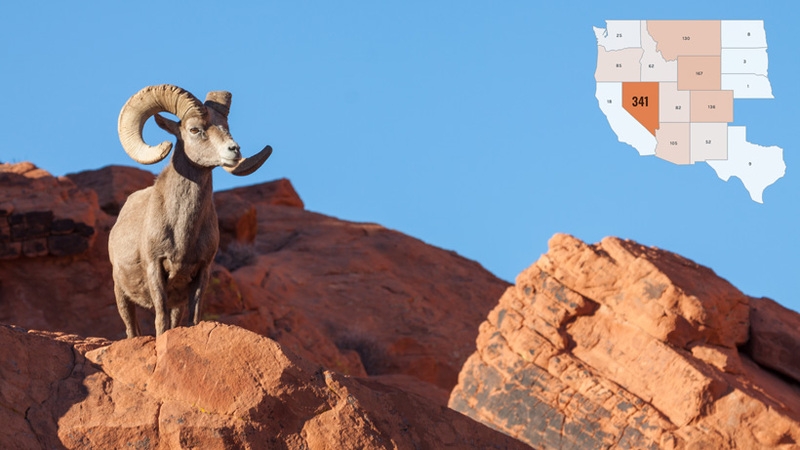 With several unit groups to select from, there are more nonresident desert bighorn sheep tags in Nevada than all other states combined. 1992 115 77% 7.1 6.7 151 7/8" 172 2/8"
1993 123 84% 7.4 6.4 150 3/8" 178 6/8"
1994 125 71% 8.6 6.1 149 4/8" 179 4/8"
1995 124 72% 7.9 6.3 150 5/8" 171 4/8"
1996 122 81% 7.4 5.4 144 6/8" 177 3/8"
1997 109 74% 7.9 6.1 145 5/8" 170 6/8"
1998 115 83% 7.3 5.8 152 1/8" 172 0/8"
1999 127 92% 5.8 6.0 147 4/8" 179 2/8"
2000 132 86% 5.9 6.3 147 4/8" 173 2/8"
2001 143 86% 5.8 6.2 150 5/8" 178 2/8"
2002 140 80% 6.4 6.3 148 4/8" 183 2/8"
2003 133 90% 6.2 6.4 150 7/8" 173 0/8"
2004 138 92% 6.1 6.1 150 3/8" 174 6/8"
2005 149 91% 4.7 6.5 153 1/8" 176 5/8"
2006 154 92% 5.5 6.7 152 3/8" 177 6/8"
2007 172 87% 6.1 6.4 149 5/8" 172 7/8"
2008 173 88% 5.8 6.3 152 3/8" 178 5/8"
2009 193 89% 5.2 6.2 153 4/8" 177 4/8"
2010 216 86% 5.7 6.5 154 1/8" 189 6/8"
2011 222 87% 4.9 6.6 153 6/8" 181 6/8"
2012 281 86% 5.7 6.5 154 0/8" 182 2/8"
2013 275 91% 5.8 6.3 153 2/8" 182 3/8"
2014 287 89% 4.6 6.4 152 2/8" 183 3/8"
2015 307 93% 4.7 6.4 152 5/8" 182 0/8"
2016 311 92% 4.4 6.5 153 6/8" 182 7/8"
2017 334 90% 4.5 6.7 154 4/8" 178 7/8"
2018 309 90% 5.4 6.4 151 4/8" 179 7/8"
Nevada has a limited population of huntable Rocky Mountain bighorns that are only found in Units 074, 091, 114 and 115. 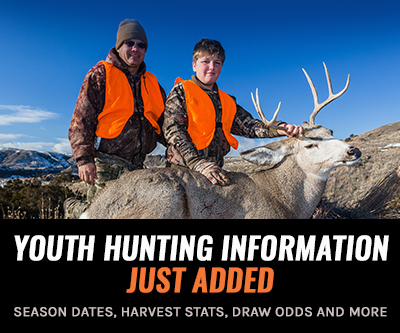 Rocky Mountain bighorn tags are only available to Nevada residents. 1995 2 100% 10.5 10.0 174 1/8" 183 2/8"
1996 2 50% 10.0 10.0 165 6/8" 165 6/8"
1997 3 67% 7.3 8.5 164 6/8" 169 1/8"
1998 5 100% 1.4 7.6 169 6/8" 176 2/8"
1999 5 100% 6.4 7.4 159" 176"
2000 4 100% 4.3 7.5 164 2/8" 173 3/8"
2001 3 67% 5.7 6.0 174 2/8" 178 1/8"
2002 3 100% 3.0 6.7 167 6/8" 183 1/8"
2003 6 100% 4.7 6.8 168 1/8" 183 4/8"
2004 6 83% 3.2 8.0 176 7/8" 189 4/8"
2005 6 83% 8.5 7.4 174 5/8" 178 2/8"
2006 6 83% 2.7 7.0 170 1/8" 190 5/8"
2007 9 100% 3.2 6.1 172" 190 5/8"
2008 13 92% 6.4 6.8 169 4/8" 191 5/8"
2009 11 100% 3.8 7.9 172 2/8" 195 4/8"
2010 4 100% 3.0 5.8 153 6/8" 160 1/8"
2011 5 60% 8.0 7.7 159 5/8" 167 2/8"
2012 8 88% 5.1 7.0 158" 174 7/8"
2013 7 100% 6.3 6.6 153 3/8" 170"
2014 5 80% 12.0 7.0 150" 154 6/8"
2015 4 25% 10.0 7.0 146 5/8" 146 4/8"
2016 5 40% 11.6 5.5 151 5/8" 155 6/8"
2017 6 50% 7.5 7.7 162 6/8" 167 6/8"
2018 5 100% 9.4 5.8 140 3/8"* 166 2/8"
Located in the northwest corner of the state are 13 different units that offer California bighorn sheep hunting. 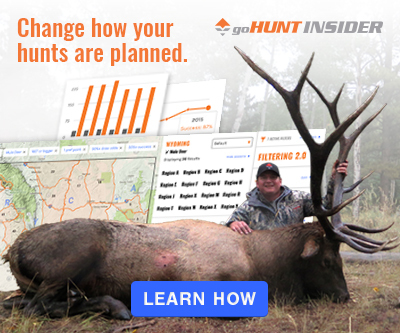 Out of these 13 hunt areas, there are 61 total ram tags. California bighorn sheep are considered a smaller subspecies of the Rocky Mountain bighorn sheep, but are not recognized as their own species by B&C. 1994 20 70% 5.8 7.1 150 0/8" 164 6/8"
1995 25 76% 7.2 7.5 146 6/8" 166 1/8"
1996 33 88% 6.1 7.6 151 4/8" 170 2/8"
1997 36 86% 6.6 6.9 147 4/8" 175 2/8"
1998 41 78% 6.1 6.8 149 6/8" 167 0/8"
1999 47 77% 6.8 6.2 144 6/8" 167 2/8"
2000 43 91% 5.5 6.9 145 5/8" 166 5/8"
2001 37 92% 5.0 7.4 148 5/8" 184 7/8"
2002 41 83% 5.8 6.4 146 3/8" 165 7/8"
2003 39 87% 6.1 6.8 148 6/8" 168 7/8"
2004 35 91% 5.7 7.3 152 2/8" 166 0/8"
2005 39 90% 7.1 6.6 149 5/8" 167 1/8"
2006 42 88% 7.3 6.8 151 5/8" 171 3/8"
2007 43 100% 6.4 6.8 147 4/8" 165 2/8"
2008 42 95% 6.1 7.1 152 3/8" 172 4/8"
2009 48 98% 7.0 7.3 155 3/8" 169 6/8"
2010 52 100% 6.4 7.4 156 0/8" 175 1/8"
2011 57 95% 6.2 7.0 153 6/8" 173 2/8"
2012 59 90% 6.1 7.0 149 0/8" 169 4/8"
2013 67 91% 6.4 7.2 153 5/8" 171 7/8"
2014 66 88% 6.1 7.0 153 1/8" 174 0/8"
2015 63 89% 5.3 6.8 153 0/8" 172 7/8"
2016 57 95% 6.7 6.8 152 1/8" 172 3/8"
2017 57 93% 8.6 6.7 151 1/8" 177 4/8"
2018 61 97% 7.8 6.4 149 0/8" 175 6/8"
After all of that said, there should be no doubt on why you need to apply for sheep in Nevada! Hopefully, this quick dataset highlighted why Nevada truly is the king of sheep in the West! Without the help of NDOW, The Fraternity Of The Desert Bighorn, Nevada Bighorns Unlimited, hard-working volunteers, and plenty of other groups, these sheep numbers wouldn't be possible. This dataset is also a small sample on the amount of research material you will find using goHUNT's INSIDER set of tools. 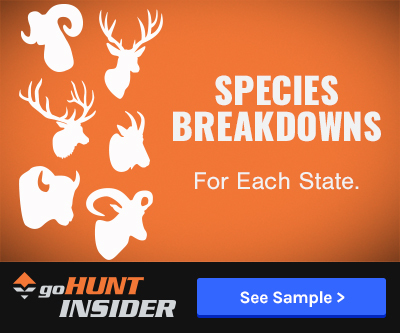 For an even further breakdown, I highly suggest checking out our Nevada Draw Odds, and Filtering 2.0 tools to locate the perfect unit, as well our application strategy articles. Once you're finished with your research, you can also apply online here.